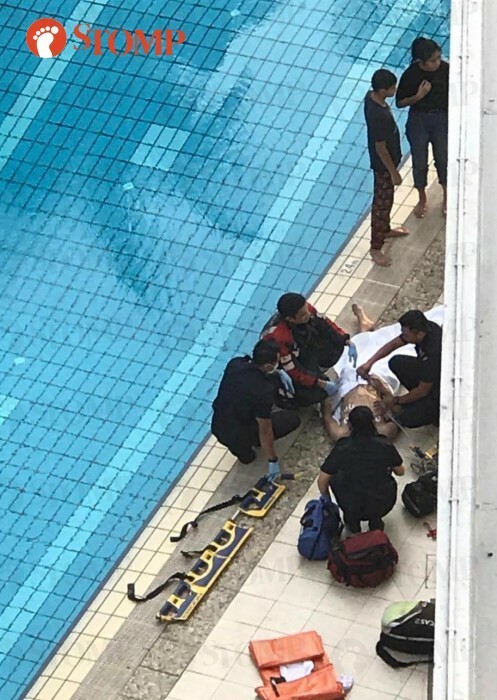 Two young siblings heroically pulled a struggling 16-year-old boy out of a 2.4-metre deep pool at Marymount View condominium on Christmas Day, saving him from drowning. Stomper Lim, who is a friend of the boy's mother, relayed this story of the brave pair. Mr Lim explained that the teenage boy and his family had come to Singapore from Malaysia for a short trip during the festive season. On Dec 25, Mr Lim organised a party at his home in the condominium to celebrate the boy's birthday in advance. Mr Lim recounted: "During the party at about 5pm, the birthday boy said that he wanted to go swimming. "His parents obliged and so he left the house. "Then at about 6pm, I heard knocking on my door. "I opened it to find many Singapore Civil Defence Force (SCDF) officers looking for me. "That's when I found out the boy almost drowned when he went swimming." The Stomper and the boy's family were not aware that the boy was drowning until SCDF officers alerted them. Fortunately, the siblings, who are residents of the condominium, discovered the boy and rescued him. The siblings' father, Mr June, first heard shouting coming from the swimming pool downstairs, according to Mr Lim. When Mr June looked out of the window of his unit, he saw the boy struggling in the water. Mr Lim told Stomp that Mr June immediately sent his two children, Julis, 20, and Joshua, 13, down to the pool. At the same time, Mr June went to inform a guard about the incident while his wife called the SCDF. The siblings told Mr Lim that when they first arrived at the pool, there was no one in sight. But when they took a closer look, they saw the teenager submerged in the pool. Mr Lim said: "They told me they jumped into the pool and dragged him to the side of it, before lifting him out of the water. "They said his lips and fingers had turned blue. "When he was laying on the ground, Julis, the sister, performed cardiopulmonary resuscitation (CPR) on him till he regained consciousness." At this point in time, the siblings' mother was watching the incident from the window of her unit. She captured a video and picture which the Stomper sent to Stomp. In the video, Julis can be seen rubbing the back of the boy. The SCDF then arrived at the scene. In the picture she took, SCDF officers can be seen attending to the boy. In response to a Stomp query, the SCDF said: "The SCDF received a call for medical assistance at 11 Pemimpin Drive on Dec 25 at 6.05pm. "A male teenager was conveyed to Tan Tock Seng Hospital by an SCDF ambulance." Mr Lim explained that the boy was conscious when in the ambulance. The boy told the officers where Mr Lim stayed so that they could alert his family and Mr Lim of the incident. "After some follow-up medical checks, the boy was discharged from the hospital yesterday (Dec 27), on his birthday. "Without the brave pair of siblings, he might not have had the chance to celebrate his sixteenth birthday. "The two siblings have small statures and I do not know how they had the strength to pull a 1.7-metre teenage boy out of a deep 2.4-metre pool. "The boy is grateful to the siblings for rescuing him without any hesitation. "The boy's parents would also like to extend their thanks to the staff at Tan Tock Seng Hospital who rendered the necessary help and provided good care to their son." Mr Lim added. On the day he was discharged, the boy and his family went back to Malaysia and therefore, were unable to meet the siblings and their family.